For several years now the City of Mannheim in conjunction with the chamber of commerce and the city's marketing agency has organised the Radsalon, an annual cycling festival with an exhibition. 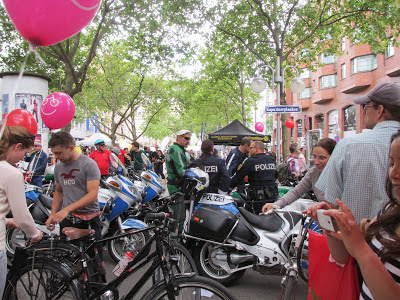 This is held in a square in the middle of the main shopping area of the city and attracts not only bike freaks but shoppers out to pick up some new clothes. Last Saturday (22 June 2013) stands included the ADFC - the German cycling club, a secondhand bike sale, a number of local and regional bike shops, bicycle manufacturers, an energy agency, the car sharing club, free bike checks - as part of the Baden-Württemberg provincial campaign to encourage cycling and VELOTransport - a government sponsored project to encourage the use of cargo bikes by families and by small businesses. I would like to have visited the Riese and Müller stand with its cargo e-bike and electro- and normal versions of these exceedingly clever bikes, but we had very little time to spare. We were on the ADFC stand advising folk about buying cycling helmets, discussing the advantages of membership and giving out our tour programme. The VELOTransport stand was next door to ours and I did notice the lads on the stand were kept busy with visitors. In a quiet five minutes I had a quick chat with both members of staff and looked at the five or six cargo bikes and trikes on the stand. The VELOTransport project is designed both to demonstrate the usefulness of cargo bikes to young families aiming to dump the car or small businesses who need to move small amounts of stuff in city centres where car parking is expensive and restricted. The stand offered hands-on experience of these bikes. The group had cleverly visited a wide range of events over the last year including the biannual German Protestant Church annual meeting, an Ideal Home exhibition and a caravan show, so did not restrict themselves to cycle exhibitions. As a back up the project offers a well thought out and extensive database of bikes, trikes and equipment for cargo carrying available in Germany (http://www.velotransport.de/). The website is in German unfortunately, but a lot of the links are to English language websites and if not there is always Google Translator. The highlight of the Radsalon is a mass ride around Mannheim and Ludwigshafen, across the Rhine in Rhineland Palatinate. This year over 650 riders on all sorts of bikes and trikes took place. 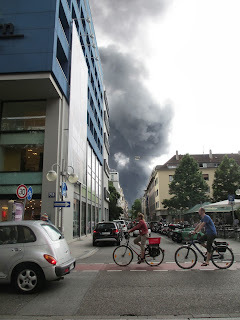 The trip across the Rhine was cancelled because of a major fire in Ludwigshafen harbour.